On the eve of President Jacob Zuma’s visit to Zambia, DA leader Mmusi Maimane called on him to distance himself from “dictators” like Zambian president Edgar Lungu. “President Zuma must use this engagement with President Lungu to raise South Africa’s strong objections to the crisis unfolding in Zambia under Lungu’s watch,” Maimane said in a statement on Friday. On Thursday, the Presidency said Zuma would be in Lusaka, Zambia, on Saturday to officially open the 91st Agricultural and Commercial Show. He would be there as a guest of honour, at Lungu’s invitation. 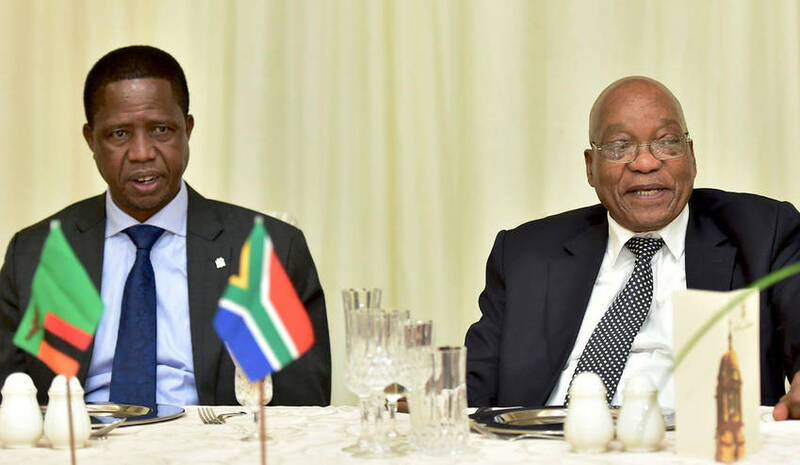 “South Africa and Zambia have good bilateral political, economic and social relations, underpinned by strong historical ties dating back from the years of the liberation struggle,” the Presidency said in a statement. Both countries had signed 21 agreements and memorandums of understanding over the past two years. These include one in the field of agriculture. Minister of Agriculture, Forestry and Fisheries, Senzeni Zokwana, would accompany Zuma. On May 25, Maimane flew to Lusaka to attend jailed opposition leader Hichilema’s treason trial. He was denied entry into the country and put on the first plane back to South Africa. Hichilema was arrested in April after his motorcade did not get out of the way of Lungu’s motorcade quickly enough at a cultural festival. He was charged with treason, which is punishable by death in Zambia. “It is clear that these trumped-up charges are a witch hunt by an increasingly threatened President Lungu, and pose a very real threat to democracy on the African continent,” Maimane said. South Africa could not continue its “quiet diplomacy” as it could lead to democracy being undermined. “South Africa must work with its neighbours to protect democracy because, in Africa, a threat to democracy for some is a threat to democracy for all,” he said. According to the global human rights watchdog Amnesty International (AI), last year’s presidential election was marked by political violence. “The authorities used the Public Order Act to repress the rights to freedom of expression, assembly and association; the police used excessive force to disperse meetings of opposition parties. The authorities cracked down on independent media outlets and harassed journalists. In April, there was a wave of xenophobic violence against foreign nationals,” AI says on its website. According to Human Rights Watch, last month Lungu declared a state of emergency. It allows police to ban public meetings and impose travel restrictions. The Zambian parliament approved this declaration, but 48 opposition MPs did not get to vote on it, as they were suspended after they did not attend a speech Lungu delivered.